Ever heard of the Sleeping Beauty experiment? It's an experiment that, for many reasons, will never be conducted. If it were, we'd have to rethink the way we calculate the odds of a coin flip. Allow me to describe the Sleeping Beauty experiment's surpassingly creepy procedure: Sleeping Beauty is put under sedation on a Sunday. A coin is flipped. No matter what, she is woken up on Monday. She is briefly interviewed, but before she is put back to sleep, she is given a drug that wipes out her memory of the interview, and being woken at all. If the coin comes up heads, she is only awakened on Monday. If the coin comes up tails, she awakened on Monday and on Tuesday. During each interview, before she is given the amnesiac drug, she is asked what she believes the result of the coin flip was. Should she say heads or tails? Or should she just bolt for the door? There is always the conventional view. The coin came down on one side or another. When Sleeping Beauty awakes, she has no way of telling whether it's Monday or Tuesday, and she doesn't know whether she's been awakened before. No matter what she guesses, she has a 50/50 chance of getting it right. Or does she? Consider a world so depraved that it could get 1000 different volunteers to participate in this experiment. The coin will be flipped 1000 times, and 500 times it will come up heads, and 500 times it will come up tails. But Sleeping Beauty won't wake up 1000 times. She'll wake up 1500 times. Every time the coin comes up tails, she gets two interviews — making for 1000 wake up calls. When the coin comes up heads she gets a paltry 500 awakenings. Out of 1500 creepy interviews, two-thirds will be prompted by tails, and one-third by heads. Therefore, she should guess tails, knowing that there's a 2/3 probability she'll be right about a fifty-fifty coin flip. There is a third school of thought about this experiment. Its philosophy runs thusly: who cares? Each interview is the same. 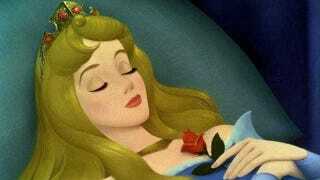 After the experiment, Sleeping Beauty will wake up and go about her way, knowing nothing about either interview. If the effect of each guess is the same, no possible choice will make a difference to Sleeping Beauty. She should be completely indifferent. I have to say, I like this third theory... especially since the preferred way to end Sleeping Beauty's indifference is to offer her a cash prize for each answer she gets right. I have to say there is an appeal to solving philosophical problems that way. "When a tree falls in the woods and no one's around, does it make a sound? Well, is there money in it for me either way? No? Then I don't care." Life could be made so simple.